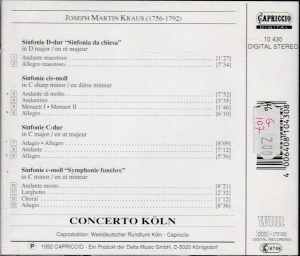 Volume 2 of Kraus’ symphonies, recorded in March 1992, the companion to Concerto Köln’s Kraus vol. 1 from 1991, Capriccio 10 396, and more fine discoveries. Kraus’ dates (1756-1792) make him an exact contemporary of Mozart, integral with the untimely death at the age of 36 (of tuberculosis), one year and ten days after Mozart (he was his younger by a mere five months). He was born and trained in Germany but his compositional career really started in full in 1778, not yet 22, when he entered the service of the enlightened King of Sweden Gustav III (famous for providing the model of Ricardo in Verdi’s Ballo in Maschera, derived from Auber’s Gustave III ou le Bal masqué). Gustav even sponsored Kraus on a four-year training tour of Europe, from October 1782 to the end of 1786 – the ancient regime version of J. William Fulbright, I call it. 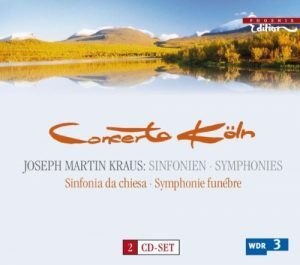 Any symphony of Kraus is going to be an early work then, but, like the compositions of Mozart, some are going to be earlier than others. 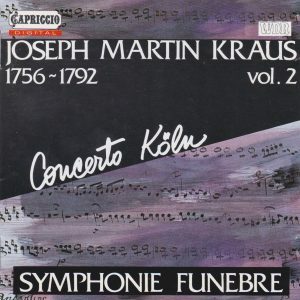 As in volume 1, the selection of Concerto Köln on this CD offers again the great Sturm & Drang emotional turbulence, especially in the outer movements of Symphohy in C-sharp minor from 1782 – the liner notes call it Kraus’ only symphony couched in four movements, but I suppose they mean in the classical Viennese four-movement structure with its Menuet or later Scherzo in third position, since the Funeral Symphony which concludes the disc also has four movements, albeit highly untraditional ones. 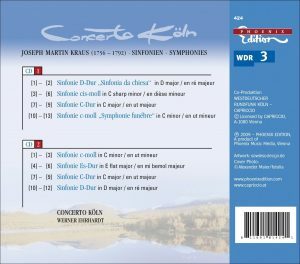 The symphony was written shortly before Kraus’ departure on his European tour and, interestingly, he thoroughly revised it a year later (“under the influence of Gluck’s dramatic and heroic style”, surmise the liner notes, although the revised work is dedicated to Haydn, who conducted its premiere), lowered its tonality to C-minor, enlarged the scoring (adding a second viola, a second bassoon and a second pair of horns, and replacing the flutes by oboes), cut the Menuetto entirely (Kraus possibly felt that it wasn’t dramatic enough) and changed the treatment of its motivic material. The revised version opens vol. 1. Truth is, the revision of the motivic treatment in the first movement is so substantial that, past the slow introduction (even more dramatic in the revision; the liner notes liken the movement to a Gluck-like dramatic scene, but that applies more to the introduction), I wouldn’t have recognized the two symponies’ common origin if I hadn’t been told so. The contrast between a first, very dramatic episode and a contrasting lyrical section (at 2:56) is far more pronounced in the earlier version, which may seem surprising in view of the fact that this was very much a tenet of the typical Viennese sonata-form of Haydn and Mozart. Maybe that’s why the liner notes called it Gluck-influenced. What is clear is that both versions share the same kind of forward thrust and turbulence. The colors of the revised version are more sombre, though (and Concerto Köln play the finale with even more drive and raging power), but I can’t say that the revision is more dramatic than the original version: both are. Only the middle Andantino, as many of Kraus’ similar movements in other symphonies, is written in a galant style by which Kraus is indeed of his time, rather than looking to the future. On the other hand Symphony in C, an even earlier work from 1780, is carefree and gay like an early Mozart Violin Concerto, and is original for featuring a prominent concertante violin. After a lamenting adagio introduction, it offers charming moments with its concertante violin dialoguing with solo flute or solo cello, and features a particularly lively finale. That these stylistic differences are not a matter of date is shown by the Symphony in D-major. It is couched in two movements, basically an introduction to a fugue, and while the introduction starts with a powerful utterance, its ensuing atmosphere is elegant and precious. The fugue is rhythmically square and, with its glaring trumpets, four horns and two timpani, it develops a mood that is grand, festal and regal rather than conveying the same sense of emotional turbulence of similar fugues in other symphonies of the classical era. It is only after listening to the music that I read the notes and learned that it had been composed in 1789 – one of the only two symphonies composed by Kraus in his later years – for the opening of the Imperial Diet (no, King Gustav III of Sweden didn’t think he needed to lose weight: it was the general assembly of the Imperial estates of the Holy Roman Empire, but I had to look that one up on Wikipedia, the liner notes leave it unexplained) in the cathedral of Stockholm, hence its subtitle of “Sinfonia da Chiesa”. But the true masterpiece and really original piece here is the Symphonie funèbre – funeral symphony – written for the lying-in-state of Gustav after he was shot (the lying-in-state is the traditional ceremony “in which a coffin is placed on view to allow the public at large to pay their respects to the deceased”, another one I looked up on Wikipedia, Glory be to you, instant source of universal knowledge). I can say it no better than the liner notes: “the four-movement work represents a synthesis of elements of the funeral march favoured in the period of the French Revolution and, particularly, of the instrumental funeral music cultivated in Masonic circles”. The orchestra includes a large family of winds – oboes, clarinets, bassoons, four horns, two trumpets and timpani – besides the strings, but the volume is always muted and, not surprisingly, the tempo in all four movements is slow, and the mood, funeral and mourning, even in the final and extended fugue. In their numerous recordings of music from Vivaldi to the early romantics made since 1987 (see my review of the companion volume 1 for more precise references), Concerto Köln has never failed to satisfy and deliver readings of high excitement. They play with verve, zest, bubbling energy and raging thrust. Only in the andantino of Symphony C-sharp minor did a get the sense that they were a tad too slow – I’d love to hear it played at the more forward-moving gait that no doubt… Concerto Köln would adopt in such a movement. Anyway they must be lauded for providing such valuable rediscoveries of composers whom posterity did not treat well.